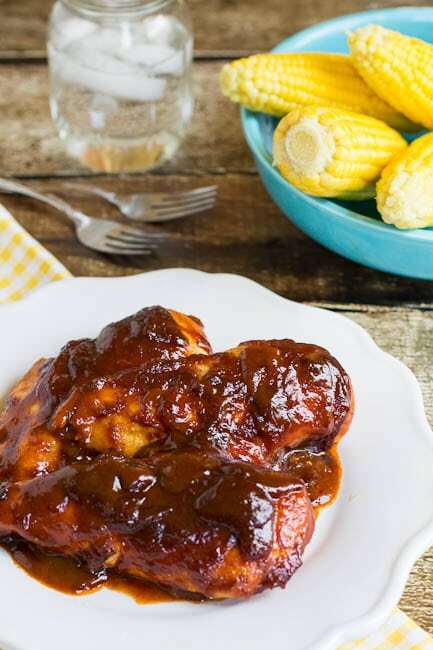 Oven-Barbecued Chicken in a thick sauce that’s sweet and tangy makes an out of this world family dinner. This is one of my all-time favorite recipes and I find myself making it again and again. It’s a recipe from America’s Test Kitchen and if you’ve tried their recipes before, you know they are always winners. I’m a big fan of cooking BBQ Chicken in the oven. It’s almost always no-fail and no-hassle. The times I’ve tried to do it on the grill, I’ve ended up with a burned and charred mess of raw on the inside chicken. 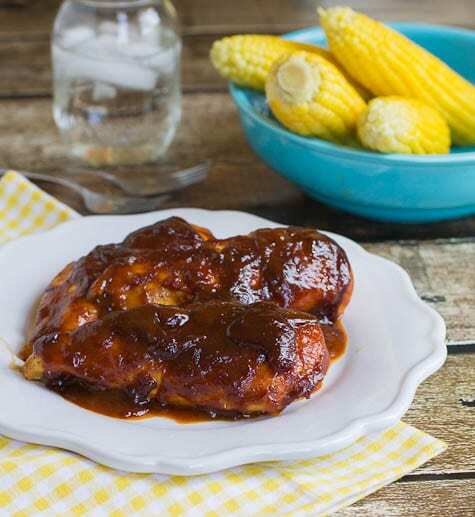 Often times oven-barbecued chicken recipes result in a watery, runny bbq sauce that won’t stay on the chicken. But not this one. It cooks up super thick and really coats the chicken. This Oven-Barbecued Chicken is both sweet and spicy which is just the way I like my food. You start the recipe by browning the chicken in a skillet just to give it some color. You set the chicken aside while you cook the sauce in the same skillet. Did I mention this recipe only dirties 1 pan? Place the chicken back in the sauce, turn to coat it well and pop it in the oven until the chicken is cooked through. Lastly, turn the broiler on just long enough to thicken the sauce and char it in spots so it will taste like it came right off the grill when you didn’t even have to go outside. What’s really impressive about this recipe (besides its phenomenal taste) is that it is made with boneless, skinless chicken breasts. As you probably know, cooking up flavorful and juicy barbecued chicken without the skin or bones is no easy task. This recipe is sure to become one of your favorite weeknight chicken recipes. No burned, but undercooked barbecue chicken on the grill! 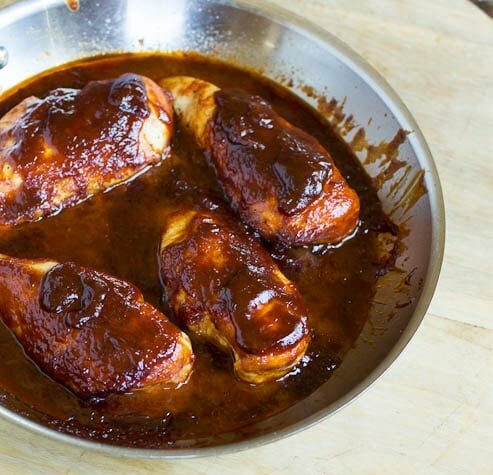 This oven-barbecued chicken comes out perfect every time and is coated in a thick, sweet and spicy sauce. Place oven rack in upper-middle position, about 5 inches from heating element and heat to 325 degrees. Whisk ketchup, onion, Worcestershire, mustard, molasses, maple syrup, vinegar, chili powder, and cayenne in small bowl. Set aside. Heat oil in an oven-proof skillet over high heat and season chicken with salt and pepper. Once pan begins to smoke, add chicken and cook 1 to 2 minutes per side, until lightly browned on each side. Transfer to a plate. Add sauce mixture to skillet and simmer over medium heat for about 5 minutes, stirring frequently. Take pan off heat and add chicken back to pan. Turn to coat well with sauce. Place in oven and cook 10 to 14 minutes. Set oven to broil and keep cooking until thickest part of chicken registers 160 degrees, 5 to 10 minutes. Watch chicken carefully during this portion. The sauce will burn if it is too close to the heating element. This entry was posted in Main Dishes and tagged BBQ, chicken, oven barbecued, poultry. Bookmark the permalink. I’ve never made BBQ chicken in the oven and that needs to change. This looks fantastic, and the ingredients in the sauce sound terrific! This chicken looks so incredibly scrumptious! Homemade bbq sauce is the best! The chicken looks wonderful. I think you’ll really like it Lindsey. The flavor is awesome! I can’t resist a thick barbecue sauce. Looks amazing! Thank you Monica! I love a really thick, flavor packed sauce too! I’m all about the sweet bbq chicken. This looks like the perfect down home South chicken meal. Pinning for later. Have a beautiful Tuesday Christin! Sweet and spicy chicken sounds delicious! I like that bbq sauce! This BBQ chicken is making my mouth water!! That sauce looks so good. Delicious! ATK is amazing. Seriously. I’ve never had a non-delicious recipe by them. I have friends that aren’t foodies who cook exclusively ATK recipes.